If you're seeking home staging pictures to use in a portfolio because you're new in business and you don't have any of your own already, don't worry because there are ways you can get access to some to help you launch and grow your homes staging business. 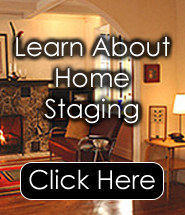 One of the best ways is to have a Home Staging Showcase Book, filled with many before and after pictures, which helps to illustrate quickly and easily what staging is all about. Filled with captions and other pertinent information, the Showcase Career Book is an excellent tool for professional home stagers to use to explain the concept. Take advantage of the years of knowledge and success that have gone into the writing of Decorate-Redecorate's Home Staging Showcase book. At the website you'll learn about all the other products that are also available with home staging pictures, such as the musical slideshow CDs. There are two different slideshows you can acquire: one for the home staging industry and one for the interior redesign industry. Set to a selection of easy listening music, the slides automatically change, showing many examples of homes that have received professional help. Interspersed between the picture slides are other slides that list statistics and benefits that can be derived by utilizing the services of a professional. The homes chosen for the slideshows vary and were chosen from all different income levels, so that no matter who sees the Show, there should be a home in the mix they can relate to. At Decorate-Redecorate.Com, great attention has been given to creating exclusive, one-of-a-kind tools for the staging professional. Many people don't have the technical knowledge to create these types of visuals for themselves. Fortunately they don't have to because it's all be done for them already. If you are a professional, you can even purchase many of these products in small bundled quantities at a discount price. Obviously the more you have of these CDs or Home Staging Showcase Books filled with home staging pictures, the faster your business will likely grow. If you're not marketing your business continuously, you don't have a business. Take a few moments to check out all of the valuable promotional tools you can find at www.decorate-redecorate.com. Whether you are a professional stager or not, you'll find exactly what you need in a home staging resource from Decorate-Redecorate.